Letters and diaries, or "journals" as they were called, form the foundation of our early history. It is by studying these writings that historians are able to tell us the history of those times. The Journal of Martin McLeod, from which the story of the buffalo hunt was taken, was edited by Grace Lee Nute for the Minnesota Historical Society's publication in 1922. McLeod was a young man of twenty-three years when he travelled from his home in Montreal to Red River with the expedition of that strange and colorful man "General" James Dickson. Dickson said he planned to recruit an army of Red River Metis to aid the Texans against Mexico and establish an "Indian Kingdom" in California. Sounds fantastic, doesn't it? But in the summer of 1836 a number of sincere young men believed in him and were willing to follow him. The "General's" schemes came to nothing, and he straggled into the Settlement on foot December 20, 1836, followed by a pitiful, half-starved remnant of his "expedition." In his journal Martin McLeod, who later became a prominent leader in the infant state of Minnesota, gives us a vivid picture of winter travel on the plains, and of life in the Red River during the winter of 1836-37. He began in July, 1936 - "A thought has just struck me - as I am about to enter on an adventurous 'career' I will keep a journal ... " And a splendid journal it is. As we read it we can almost feel that we know this man and share his troubles and heartache. This is his story of "Buffalo Hunting in the West." It was written in his journal while at Red River in January 1837. The first season of the Buffalo hunting commences about the 15th June and is continued to the 1st August. The second season commences in September and terminates late in the fall, generally about the 1st of November leaving time sufficient to return home before the cold weather sets in. 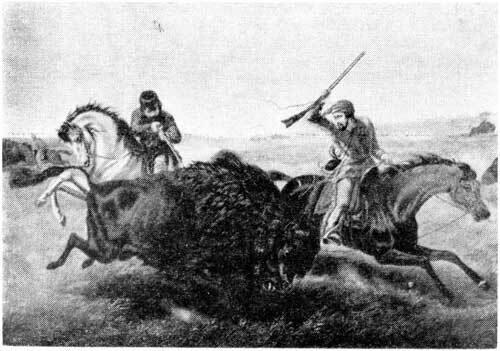 I allude to the Brules' hunting, as the Indians who inhabit the Buffalo country kill these animals at all seasons. The Brules generally set out with 500 to 600 carts drawn principally by oxen. Their wives and daughters accompany these carts for the purpose of preparing the meat which is done by stripping it from the bones and spreading it upon scaffolds of poles elevated 3 to 4 ft. from the ground under which they build a fire of the buffalo dung. In this manner they continue to dry the meat as fast as it is killed by the hunters. It requires the flesh of twelve of the largest animals thus prepared to load a cart drawn by an ox - and allowing 600 carts to the spring season would make 7,200 of these animals killed in about a month by the Brules alone, not including any of the various Indian tribes such as the Sioux and Mandans, Gros Ventres etc. all of whom inhabit the Buffalo country and destroy these animals by the thousands. And add to this too that in the spring nearly all 'the animals killed are cows, the meat of the male not being good after a certain season. These different causes account for the rapid decrease of the Buffalo within the last few years. I have been informed by a Brule hunter that at the last hunt they had to go a journey of 15 days to the west, 6 farther than ever they went before. In the fall hunt besides the dry'd meat they make Pemmican and also bring home a great quantity of the meat in its natural state. The Pemmican is made by drying the meat as I before mentioned. It is then beaten into small pieces and placed into a sack made of the Buffalo skin - into which is pour'd a quantity of the melted fat of the animal. When it cools, it is pressed into the sack which is sewed up. In this manner it will keep for 3 or 4 years. The sacks are various sizes but the common sizes are from 100 to 150 lbs. The usual number of horsemen attending these hunts are about 500. However not more than from two to 300 act as hunters and they are those who possess the swiftest horses. The hunters are exceedingly expert, notwithstanding which many accidents occur. I have seen many of them with broken legs, broken arms and disabled hands. This latter accident frequently occurs from their manner of loading their guns. They never use wadding. The powder is carelessly thrown in more or less quantities the ball is then tumbled in upon it, and off goes the shot. This is done to save time, and it is almost incredible what ,a number of shots one person will discharge in riding the distance of 3 to 4 miles, the horse at the top of his speed. A gentleman who has lived many years in the Buffalo country says that upon the least calculation four to five hundred thousand of these animals are killed yearly on this side the Missouri.